When a couple goes to purchase a wedding set they are looking at more than style; they are looking to discover a treasure that will compliment their qualities as husband and wife. Peace of mind for those shopping online looking for a legitimate deal. If you want to use a local shop to get assistance in choosing a ring that would be right for you. Be sure and keep in mind that you should purchase from a business with a solid reputation that has been in business for at least 10 years with a good money-back guarantee such as 30 days or better, along with an “A” or better rating from the Better Business Bureau. A drawback in having a salesperson assist you in purchasing and choosing your ring is that they are there to sell, and may try to coerce you. Some red flags in this situation are obvious if you know what to look for; if it’s on sale, they may not have it tomorrow, or if it’s the last one and the clerk wants you to buy it immediately; are some common signs that you are likely being manipulated. Never purchase a ring that is not exactly what you want. You have to be the one that enforces your budget. An advantage to a local shop is that you can have a professional size your finger to get the perfect fit. Online stores offer printable ring size guides so you can do it yourself. You can go online to research big-name designers to get an idea of the style you want that cost more than lesser known privately owned jewelers. Choose a jeweler that lets you create your own ring, inform him of your favorite design and more likely than not, you will be able to purchase the ring for less and still get the designer effect you want. If you purchase a diamond that doesn’t quite hit the full Carat by a few points that diamond will be significantly cheaper than in a stone at popular carat sizes. For example, a 1.9 carat diamond would cost less than a 2 carat ring. For a white gold effect, you can use platinum or palladium — — which will cost much less without losing the charm and beauty of this classic color. To complement any style engagement ring. The classic yellow gold band does the trick. Yellow gold complements most skin tones, is cost efficient and traditional; Available in 14, 18 and 24 carat gold. Keep in mind that the purest and most expensive gold is 24 carat, a drawback to this is that it will be extremely soft and will bend, chip, and scratch easily. White Gold needs a lot more maintenance than yellow because it has to be resurfaced yearly, or it will discolor. Most brides choose white gold, to complement their skin tones, and because it is the perfect alternative to platinum. There are several ways you can combine light yellow gold. You can get it in the twisted patterns such as braided and carved patterns such as the Celtic style which is a good example of this. 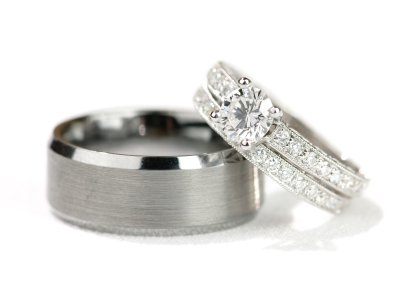 Platinum is one of the hardest and most expensive metals, if you think about it; it’s a great way to express a couples everlasting love and commitment, because it will never wear out. The ideal that will last forever, always be beautiful, and can be passed down through the generations make this an ideal ring for many brides. If you’re looking for a simplistic design that’s not too flashy the domed ring which is available in just about any metal is the best way to go. Another option is the more contemporary flat band; this type of band has squared off edges and looks sleek and modern. A popular style for women is the eternity band which has all over diamonds. To add flair and style to your band, you can have special metal treatments given, such as the much sought after hammered look. By adding embellishments such as filigree and etched or engraved patterns — including graphic motives (Celtic, zodiac or sports) to dress up the band and showcase your style. If your man wants a look with more bling there are many wedding band styles that have gemstones in them. The most sought-after gemstones are diamond, ruby, and sapphires. The drawback with gemstones in men’s rings is that the stones are likely to fall out if he works with his hands. This is the wisest thing you can do to protect your sparkling investment. Insurance guarantees your diamond will be replaced if lost, stolen or damaged. The idea is that it will last forever, always be beautiful, and be passed down through the generations make this a must for many brides.